Do you start the year with great intentions and you hit an obstacle and before you know it, you’re back to your old routine and stuck in the same spot you told yourself you would not be. Do you want to FINALLY have results that last? Are you ready to feel amazing? Do you want to reach a level of success you never thought imaginable. Then don’t hesitate. Make the commitment today. It’s time to join my Beachbody Challenge group! I have found that so many people truly want to get results. Most people even get motivated at some point to start a new program, but too often the missing ingredient is accountability. Without an incentive or someone holding you accountable to your workouts, the motivation fades, excuses take over and before you know it, you’re back to your same old routine “of out of shapeness”! Challenge groups are an online supportive community (privately held in a Facebook group) where a small group of individuals come together to help each other reach their goals. All workouts are done in the privacy of you own home or fitness area. There are no group workouts. No schedules to follow but your own. You are simply posting your workout daily, interacting and supporting others. You’ll make great friends. The support is amazing and best of all, you’ll get the results you have always wanted! Your first 30-Day Supply of Shakeology (includes free shipping). Your Shakeology will delivered on autoship every 30 days. Rest assured you’ll never miss a day of the Healthiest Meal of the Day! A FREE trial month of the Beachbody Club Membership including access to the Meal Planner, 10% discount on future purchases and unlimited support and accountability. All Challenge Packs come with a 30-Day Money Back Guarantee. Yep! If you are not satisfied for any reason whatsoever, you return it (less S&H) and you’ll get a full refund. So seriously, if that is not the biggest incentive to get started, I don’t know what is! Which Workout Program is Right for You? Depending on your current level of fitness, there are a variety of programs in which to choose. Do you like a lot of weights or are you more of a cardio junkie? Do you like variety? Do you like kickboxing? There really is a program suited to your needs. Whether you choose a beginner or advanced, each program is designed for all levels. So, if you have always wanted to give P90X a try and feel it is to advanced, the program comes with a complete set of modifications for all levels. Here are just some of the programs I offer. Please send me a message so we can discuss what program is appropriate for you. 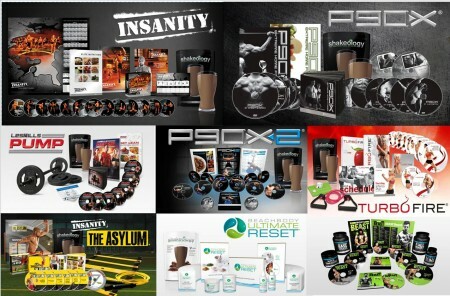 All Challenge Packs range in cost from $140 to $245 depending on the workout program you choose. You will save money by purchasing the pack rather than ordering Shakeology and your workout individually. But the best part, you’ll be coached by me! You’ll succeed with the Challenge Group! Once you have decided which program is best for you, place your order by selecting one of the links above or simply contact me. You will then be placed into a private challenge group! I look forward to help you be successful with your health and fitness goals..